About two years ago, I wrote about moving to a Sandisk Sansa Fuze as my music player. 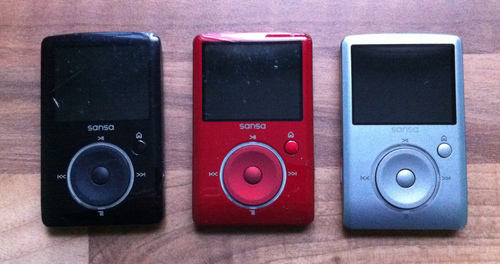 I transitioned from a 40G, HDD-based iRiver to an 8G flash-based player, with an additional 32G supplied by a micro SD card, both running the rockbox open-source firmware. It took three attempts to get a 64G microsd: the first was faulty or fake, the second never turned up. Third times a charm, and a third sansa fuze (to get 8G internal capacity) completes the story. For the sansa fuze, to get a 64G microsd to work, one needs to change the partition type to 0x0c (W95 FAT32 (LBA)) and reformat with FAT32. (Interestingly that's actually hard to do for Windows users, as Win 7 refuses to offer FAT32 for flash devices over 32G in capacity by default). I now have approximately 67.7G of storage on a single device and all my music in one place again (albeit two storage locations) which feels surprisingly good! Thanks for this. Your timing couldn't have been more perfect...just when my old, restrictive and really not very good Sony Walkman had given up the ghost (bought by my brother who knew no better). With your advice to hand I looked up the Sansa's specs and was very pleased by what I saw...comparable to much more expensive devices...so I have one winging its way to me. I had a similar issue, upgraded my old iPod 40 Gig (running Rockbox) to a Cowon X7 160 Gig device. It's not running Rockbox any more, but the extra capacity was well worth it. There are a few issues with tagging of multi-CD albums (it doesn't play tracks in the right order), but generally it's pretty good. 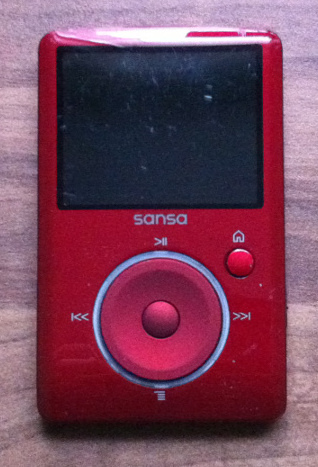 I had that Sansa Fuze too, it had some minor problems (like being slow to update music collections, etc) but as far as mobile audio players go, it was a great device. I liked that it could take SD cards and play FLAC and had an FM Tuner and it delivered high quality sound through some nice earphones I bought for it. Too bad it got stolen by a woman who sat next to me on a plane a few months ago. I considered buying another one but I couldn't find one on the usual on-line sites. I see there's a newer model available but it got horrible reviews. Not sure what I'll go with next, it's sad that people have just seemed to have given up against the iPod, which is actually pretty mediocre compared to my old Fuze in many ways as a music player. Sadly the successor 'Fuze+' is terrible. The physical click-wheel is replaced with four touch buttons which are very sensitive and hard to use. It also rules out operating it from your pocket without looking. A shame, as 16G built-in would be nice. Good choice, I am using a Sanza Clip Zip which has similar advantages indeed. Plus a standard micro-USB socket, which this one does not have, does it? The Clip Zip is indeed very similar. Sadly the Fuze has a proprietary connector, similar but different to an iPod one. If one arranges for the data on the internal storage to be relatively static, you only need to use it to charge the thing and/or pull the play data off it; you could remove the microsd and put that into an SD slot via adaptor. I tend to do that if I'm going to do some heavy filesystem work (rearrange, add, remove, tagging, etc.) because it's faster than via USB and a smidgin more reliable. any idea where I would get one of these mp3-player? I've got all of mine via eBay. You occasionally see them on Amazon but usually for more than on eBay. IT's worth searching for 'sansa fuse' as well as 'fuze' since some listings spell it incorrectly. I usually pay around £30, but you can do better if you don't want a large internal capacity.